The Rule calls on Carmelites to share daily in the Eucharist. The chapel is to be in the midst of the cells, which evokes the heavenly Jerusalem and the altar at its center (Rev 8). It also calls to mind the apostles gathered in prayer with Mary in the midst of them (Acts 1:14). In celebrating daily the Mass in the chapel, Carmelites recall the death and resurrection of Jesus. 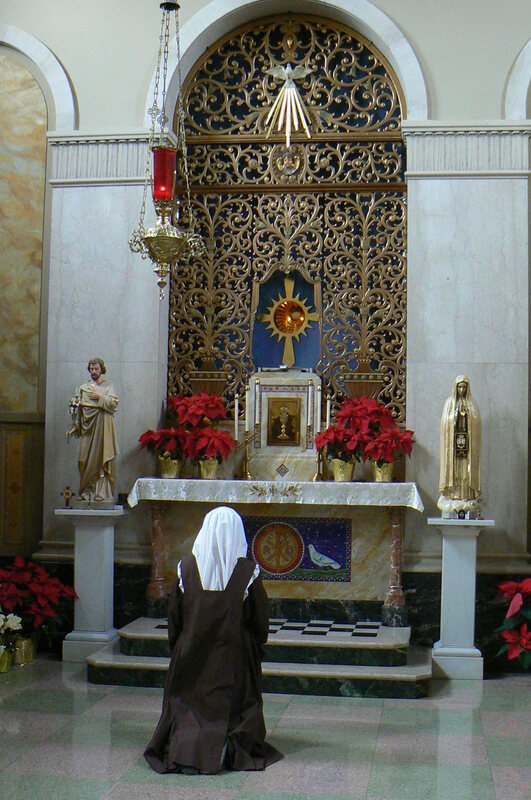 St. Teresa never felt that a new Carmel had been properly founded until Jesus in the Eucharist was solemnly placed in the tabernacle. We at the Carmel of St. Joseph are blessed that Our Lord, truly present body and soul in the Eucharist, remains with us day in and day out. Our Constitutions state that “At the heart of the community life is the abiding Eucharistic Presence of Christ, whom Holy Mother Teresa calls, ‘our Companion in the Most Holy Sacrament.’ The Eucharistic Presence of Christ fosters union with Him and sustains Teresian prayer for the Church.” Thus we are called upon to make the Eucharist the center of our life, the treasure of our hearts, the strength for our journey, the nourishment of our lives, the light in our dark valleys, the love that conquers our hearts! It leads us to choose in all things what is true, what is good, and what is beautiful. As the sun goes down each evening, we gather for Benediction of the Blessed Sacrament, wherein Jesus gives us His blessing and we praise and thank Him for yet another day. In 1959, at the request of Cardinal Ritter, then-archbishop of St. Louis, we began daily Exposition of the Blessed Sacrament in our chapel. This is unique among the Carmels in the United States. The nuns take turns adoring the Lord in their private chapel and hundreds of the faithful of St. Louis come to the public chapel to spend time with the Jesus in the Eucharist. Countless friends of Our Lord have found a closer relationship with Him through adoration of the Blessed Sacrament.